If you are feeling that the Great Fast snuck up on you this year, and you are hoping to get into the "zone" rather quickly give the Canon of St Andrew of Crete a try this week! Over the course of the first four days of the Great Fast, Great Compline is read in the evenings with a portion of the Great Penitential Canon of St. Andrew of Crete. The Canon is also read in its entirety on Wednesday evening of the 5th week so that we may approach the conclusion of the Great Fast again with a proper spirit. 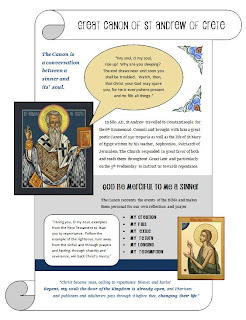 You can access and download an overview handout on The Canon of St Andrew of Crete here or for each days portion visit this link. St. Andrew of Crete (c. 660-740) was born in Damascus. He became a monk at Mar Saba and served later at the Holy Sepulchre. Around 685, he was ordained a deacon at Hagia Sophia. He also ran a refuge that took in orphans and cared for the elderly. He ended his days as Archbishop of Gortyna, a position to which he was elevated in 692, on the island of Crete. He wrote homilies that display great oratorical skill, as well as formal public speeches later used in written form of the saints. Wishing you and your loved ones the true spirit of repentance and forgiveness.